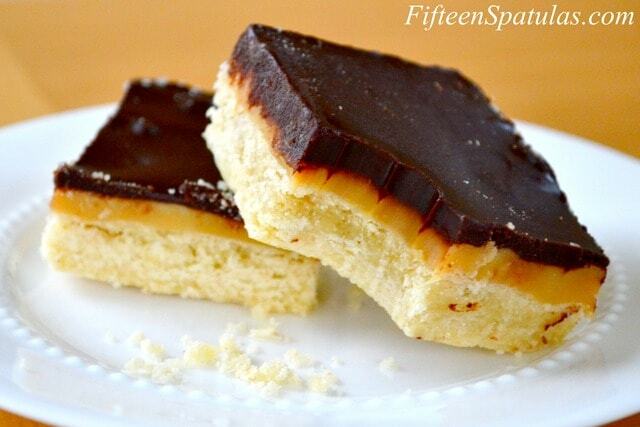 Buttery shortbread is topped with golden dulce de leche and a chocolate glaze for a delicious dessert. It’s perfect to take to potlucks and parties! These bars remind me so much of a Twix bar, only being homemade and all, they are clearly a million times better (hehehe…get it? A million? Okay, I’ll stop). Seriously though, these are an absolute treat. Buttery crumbly shortbread topped with dulce de leche and a chocolate glaze…it’s truly something that’s more than the sum of its parts. 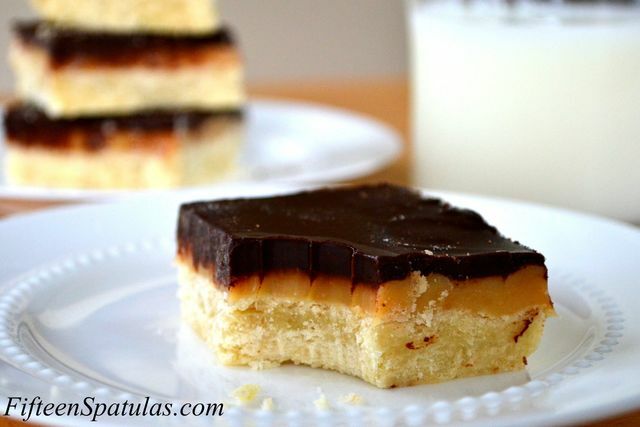 And believe me, I like Twix, but there’s partially hydrogenated oil and all sorts of other weird things in them, so when I saw this recipe while perusing a lovely little cookbook called Baked, I knew it had to be put on my priority food to-do list. After making these bars, I can’t help but look back and giggle at the note at the bottom of the recipe: “These will last 4 days in the fridge.” I don’t think these could last 4 days in ANY house, given the fact that they lasted about 4 hours in mine. 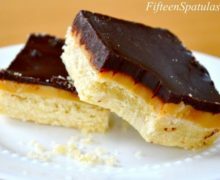 Buttery shortbread is topped with golden dulce de leche and a chocolate glaze for a delicious dessert. It's perfect to take to potlucks and parties! In a stand mixer fitted with the paddle attachment (or a hand mixer), spread the butter around the bowl by mixing for about 10 seconds on medium. With the mixer still on, stream in the sugar, and beat until the sugar and butter are blended. Add in 2 cups of the flour and mix on medium until it just disappears. Add the egg yolk, beat for a few more seconds until combined, then turn the dough out onto a lightly floured work surface. Shape the dough into a 6×6 inch square, then sprinkle the remaining 1/2 cup flour on the surface of the dough. Fold the dough over, and knead until the flour is incorporated, and the shortbread is beautifully smooth. Butter a 9×13 inch baking dish, and press the dough out into the pan. Prick the dough all over with a fork, and bake for 20-22 minutes, until golden brown. Let the shortbread cool completely on a wire rack. For the dulce de leche filling, basically we want to caramelize the sweetened condensed milk. I found it easiest to just cook the sweetened condensed milk in a saucepan over medium heat for about 15-20 minutes until it caramelized, but you MUST stir frequently with a spatula, or it will burn. An alternate method is to cook it in a double boiler for an hour, but I’m too impatient for that. Pour the dulce de leche over the cooled shortbread, and pop it into the fridge for an hour, until the dulce de leche has cooled as well. Onto the chocolate glaze! In a double boiler, melt the chocolate, corn syrup, and butter together, giving it a stir every once in a while. Pour the mixture over the chilled dulce de leche layer and spread it evenly with a spatula. Refrigerate for an hour until the glaze hardens. Once the bar has chilled, cut into squares and serve. I think these taste best when they’re cold out of the fridge, since the dulce de leche is really stretchy and chewy. Yummm! Enjoy! I look forward to trying this but I’m wondering if 2 cans of dulce de leche can be used (it’s available where I live) so one can skip cooking the sweetened condensed milk? Has anyone tried this? 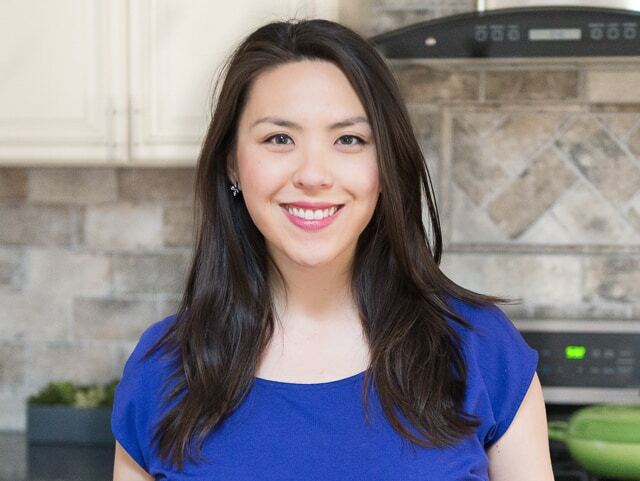 Thanks for a great website with so many good recipes – still loving the whole wheat pancakes! I don’t see why not, so sure! Enjoy! A tip for making the Dulce de Leche. The easiest way to make it is in the can. Just before the holidays I will make 4-6 cans by removing the labels and immersing them in water. Cover with at least a couple inches then turn it on simmer. Check back every 30 min. or so to make sure it has enough water and has enough water on top. Depending on how hard you simmer it it should be deep golden in about 5-6 hours. I go for medium/low about a 4 on my stovetop. It seems like a long time but it is one thing I can do while cleaning the house for guests. Once they are done I can store them in the fridge till I am ready to use them. They last week’s, even a couple months and I have something I can pull out at a moments notice. I have heard all day (8 hrs.) in the crock pot works well too. No mess, no fuss either way. I have never had it turn too dark but every now and again it may not be as dark as I like it so I will pour a can in the pan for a few extra minutes of carmelization. Hi Christy, as I understand it this is something the manufacturer’s say not to do, because the can may explode during the process. It’s probably a rare circumstance I would imagine, but I think that’s why the authors of the book caramelize it outside of the can. Thanks for sharing!